"If I abandon this project, I would be a man without dreams." In 1982, iconoclastic German director Werner Herzog released Fitzcarraldo, a film about a man obsessed with building an opera house in the Amazonian jungle. The film is probably best remembered for the sequence that required a massive steam ship to be dragged over a muddy mountaintop by a team of native Indians, under the wild-eyed obsession of Fitzcarraldo (Klaus Kinksi). Kinski was one of Herzog's regulars and a quirky sort himself, and if you thought his subdued lunacy was the most interesting part of that film you would be dead wrong. The real story is here, when filmmaker Les Blank travelled to the Amazon with Herzog, documenting the production in Burden of Dreams in all of its unpleasantries, dangers and wild imaginings. The project seemed doomed from failure at the outset, and Blank features some rare footage from the initial 1979 production (featuring Jason Robards and Mick Jagger in the lead roles) that was eventually scrapped when both leads were unable to continue. The second attempt, that began a year or so later, proved to be no less troublesome, and with Kinski now cast as the lead, the film crew established themselves deep in the Amazon, where an eventual lack of food, sanitation, and morale slowly ate away at everyone, which Blank was there to capture. But it's not all gloom and misfortune, because a good portion of Burden of Dreams looks at the native Indians who were part of the filming, and their comparatively simple lifestyles. The jungle footage is beautiful and dangerous at the same time, with Herzog's crew doing their best not to trod on the way of the Indians, and as conditions deteriorate it seems clear that man (especially outsiders) can only adapt there, and never truly win. There is a travelogue feel to some parts, from the Indians making of harsh alcoholic liquid called masato to catching their random conversations or arguments, as with the one about a philandering husband. Blank doesn't sugarcoat the infamous Herzog ego, and he allows the director to expound in that slowly rambling way that makes him such a terrific character in his own right. Herzog refers to Fitzcarraldo as a "painful victory" full of "bad surprises", and while the finished film is a study in unadulterated obsession and ultimate failure, it is almost like a mirror to the director himself. As a document of a man trying to work against the elements, there are the obvious parallels between the character Fitzcarraldo and Herzog, emphasized by the segment on the legendary hauling of the steam ship over the mountain, something that seemed more difficult to attempt in "real life" than it did for Kinski's character. 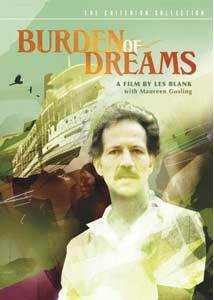 With Burden of Dreams, Blank quietly raises the unspoken question and blurs the line of who is more mad: Herzog or Fitzcarraldo? Image Transfer Review: Criterion's 1.33:1 transfer of Burden of Dreams has gone through an extensive cleanup process to remove dirt and scratches, and the result is a final product that probably looks better than it did in 1982. Colors are fairly soft, but they do retain a consistency even among a variation of natural lighting conditions. There is quite a bit of grain throughout (especially during night scenes), and though some instances of specking are still evident the transfer, this represents another impressive Criterion restoration job. Audio Transfer Review: Audio is provided in 1.0 Digital mono, and like the image transfer, has gone through a major restoration proces to reduce clicks, pops and hiss. The track doesn't offer any grand flourishes—to be expected from a documentary recorded in the Amazon—but all of the location interviews are quite clear, as is the voiceover narration. Extras Review: It is yet another set of strong extras from Criterion for Burden of Dreams, beginning with the packaging. The disc is housed in a standard Amaray case with a sturdy carboard slipcase, which is required to also house the 77-page book that is included. The Burden of Dreams book is a collection of excerpts from the journals of director Les Blank and editor/sound recordist Maureen Gosling during their time in the Amazon, which provides some layered insight into the production, and offers a peek at everything from alienation and depression to the arrival of a new beer shipment. Also included is a commentary track from Blank, Gosling and Werner Herzog, though the three were not recorded together. Blank and Gosling's comments were captured in September 2004, while Herzog provided his brief input in January 2005. As with the journal, the memories of Blank and Gosling end up being the strongest, offering not just insight on the use of music or editing problems, but an engaging expansion of what was going at the time. Strangely enough Herzog's contributions, by comparison, are minimal, but Blank and Gosling carry the track handily. Next is a short film entitled Werner Herzog Eats His Shoe (020m:17s), a 1980 film from Les Blank. It's about a lost bet with filmmaker Errol Morris that has Herzog having to literally eat his shoe, and the short film shows the preparation and the eventual sole munching. Dreams and Burdens (38m:00s) makes up for the lack of Herzog on the commentary track, and features an extensive set of recollections from the director, recorded in 2005. It's Herzog looking back, and the guy is such a fascinating subject that 38 minutes just seems like a tease. The interview is broken up into four chapters, covering the subjects of casting, dreams, danger, and parallel films. There are two deleted scenes, entitled Fight (03m:51s) and Butterflies (02m:03s), both of which eventually found their way into Herzog's film My Best Fiend, about Klaus Kinski. The two scenes showcase the extreme opposites of Kinski's apparent volatile personality, with a raging argument balanced by a gentle goofiness. Lastly, a foldout four-page insert (with an article entitled In Dreams Begin Responsibilities), a theatrical trailer and a large set of stills, shot by Gosling and broken into 12 sections, is also included. The disc is cut into 21 chapters, and features optional English subtitles for the deaf and hard of hearing, as well as a subtitle track that handles the German, Spanish and Peruvian languages spoken in the film. Werner Herzog is such a fascinating subject that it's difficult to imagine a film about him not being interesting. This fast-moving doc about the troubled Fitzcarraldo shoot mixes travelogue, ideology and standard issue technical problems into a narrative that allows Herzog to wax philosophically about his art while he struggles with low water levels, dangerous conditions, and the ultimate challenge of moving a ship over a mountain. Not unlike Lost in La Mancha in many places, Blank's film is look at a creatively adventurous director operating on the fringes and facing an array of obstacles at every turn.